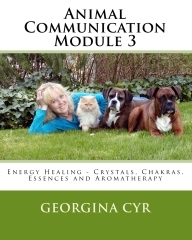 The Animal Communication Courses by Georgina Cyr are a fascinating and spiritual introduction into the animal world. These courses were designed to help you develop your natural ability to communicate with animals. You can learn at home at your own speed or in a very special workshop environment. You will receive guidance and feedback whether you take the live workshop or the correspondence course to ensure your success. We are offering Modules 1 and 2 at a discounted price of $299.00 !! Click HERE to take advantage of the Special Offer – Both Module 1 and 2 for $299.00 !! That is a savings of just over $150.00 !!! 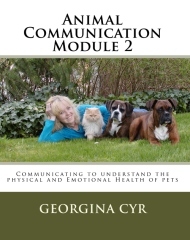 Georgina’s Animal Communication Correspondence Course is made up of four Modules: two basic and two advanced. The price per module for modules one to four is normally $225.00 per module. Canadian residents add $11.25 GST, total cost $236.25. This cost includes the guided meditations to help you as you learn at home at your own speed. For more in depth information read below. If you want to learn Animal Communication and are unable to attend a workshop, or if you have already attended a live workshop and want to further explore this exciting field, the Animal Communication Correspondence Course is course is for you! There is no time limit for completion of the correspondence course modules. You work at your own pace as your personal schedule allows. In Module 1 of the Correspondence Course, you will be guided through exercises to enable you to more easily open the channels of communication. You will learn how to get yourself into a relaxed state to better initiate contact with an animal. You will learn how to find your space, the place where you are open and aware and able to send and receive messages, feelings, pictures and thoughts clearly. You will learn how to deliver a message, how to validate the information received, how to work with your client or human caretaker of the animal and how to develop a wonderful relationship with your client. The Animal Communication audio CD which contains 3 tracks to help you. Introduction track: The Introduction track of the CD discusses Georgina’s views on working with energy and its relationship to animal communication, as well as basics on how to communicate. Guided Animal Communication Meditation track This track assists you in connecting to the animal by listening to Georgina’s voice guide you through the process of connecting. Animal Angel Music track. This track was specially channelled for Georgina by Gabrielle Silva. Gabrielle has channelled this music from the animal angels, whose gentle energy assists to help you to stay focused while communicating with an animal. Georgina’s Code of Ethics, which you are required to follow if you intend to practice Animal Communication with the methods used in this course. As well, recommended books and Internet sites are given for further reading. Tuition: $225.00 plus shipping charges. Canadian Residents must add federal and provincial taxes. You will need to Click Here to Register for the correspondence course, afterwards you will be notified of the amount of the Shipping & Handling charges as it varies depending on your location. Introduction to Energetic Emotions – the connection between Emotions and the physical body and the relationship of Emotions manifesting into physical ailments. How to perform a body scan and how to receive information regarding the animal’s health in order to be able to find out if there is pain or discomfort. How to determine what the animal feels and what they would like to help them to feel better. How to tell what different sensations mean and represent. How to determine why the animal feels the way it does and what has caused it. Learn and understand different ways to describe what the animal is feeling. Practice and keeping an open mind will help you learn to communicate with animals. If you are persistent, and have intentions of the Highest Purpose always, then you will succeed! You will receive helpful feedback regarding the accuracy of your communication as well as help in interpreting your results. Evaluations, with comments and advice for solving problems, answers to questions, guidelines, as well as pointers for more thorough consultations and to increase your competency, will be sent back to you. Email is the preferred method of correspondence. You need not be worried about your results: this is a training program and there is not necessarily a correct and incorrect answer or response. 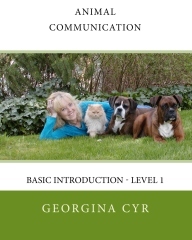 The Animal Communication Correspondence Course is made up of four Modules: two basic and two advanced. The tuition for modules 1 through 4 is $225.00 per module plus tax and postage. The actual postage cost will be determined when you register. 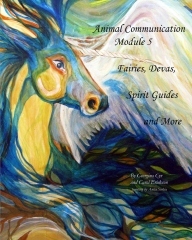 The first two Modules together make up the Spirits Of Heart Basic Animal Communication Course. Note that there is no longer a time limit requirement for completion. The ability to communicate with animals is a wonderful experience. All that is required is a quiet place to get into your space. You can then commence practicing your communication. Everything is explained thoroughly on the audio tracks and in the workbook, and you are taken step by step through the process. When communicating with an animal, you will sense the animal’s personality, then move into mentally asking them questions, performing a body scan and receiving information from them. You will then have the opportunity to tune into their Higher Self to discover profound messages about where they are in their life’s journey. Animal communication is an experience utilizing your mind and inner senses. Upon completion of the first two Modules of the Spirits of Heart Animal Communicator Correspondence Course, and once you have finished your one assigned animal communication, you will receive a dated and signed Certificate of Completion for having completed the Spirits Of Heart Basic Animal Communication Course. To receive your Spirits of Heart Certificate in Advanced Animal Communication, you must have completed Modules 1 and 2 as well as the Advanced Modules 3 and 4. Tuition: $225.00 plus shipping charges. Canadian Residents must add federal and provincial taxes. You will need to Click Here to Register for the correspondence course, afterward you will be notified of the amount of the Shipping & Handling charges as it varies depending on your location. 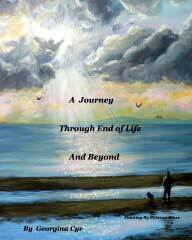 Georgina’s full-color book, titled A Journey Through End of Life and Beyond. To purchase the book separately Click Here. 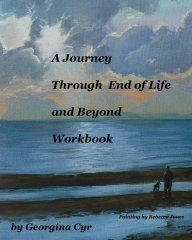 Also an instructional workbook with practice exercises, for those helping others with end of life situations. Pet Loss – Death and Dying. How to help people decide when it is time to let go. How to work with helping others experiencing loss. Understanding and working with grieving, emotions, and memorials. What the animals want us to know about the process before, during and after leaving their body. Messages from the animals – Why they come into our lives and how they help us to understand “death”. Why they are here with us. Animals’ Spirits – Where the animals go and what is it like there? Animals stories and messages about their spiritual selves. follows her everywhere and I feared that Buttercup was out as well. injured somewhere, which is where my mother’s mind tends to wander. communicate with them has already changed our lives for the better. It’s Helen from Kentucky. I am one of your animal communication students. I really like listening to the channeled animal angel music CD and I open the windows, so it can be heard outside. We love it. Is there a longer version of animal angel music? It is so beautiful, I love the way it flows and brings out feelings of love. I found your book A Journey very soft but precise way how to find the way through the death experience. Although I managed to go with understanding through all the death experiences I had so far, it is every time a challenge to say the right words to the one that is facing it, actually most of the time I feel that the silence is the most appropriate state of being with them. I had always found it difficult to mediate and to relax until I completed the mediation as week one assignment. The feeling was amazing… I felt focused and relaxed at the same time. I imagined being surrounded and breathed in a glowing cloud. I focused on the White light, tried my best to imagine it, and found my body relaxed by your guiding voice. The CD really does help me to mediate. I found listening to the CD enjoyable and it really does help me to get into my space more easily and comfortably. I am writing this email to thank you for introducing animal communication and mediation to me and the others. I believe in good karma and am very thankful to have the opportunity to learn how to mediate. Thank you so much. An optional module of Self Exploration. An Experiential module that shows you how to communicate with Fairies, Devas, Spirit Guides and Elementals. Practice exercises: To identify fairies and elementals in the books photos. Connect and communicate with the Fairies, Devas, Spirit Guides and Elementals. Tuition: $79.00 plus shipping charges. Canadian Residents must add federal and provincial taxes. You will need to Click Here to Register for the correspondence course, afterward you will be notified of the amount of the Shipping & Handling charges as it varies depending on your location. Evaluations, with comments and advice for solving problems, answers to questions, guidelines, as well as pointers for more thorough consultations and to increase your competency, will be sent back to you. Email is the preferred method of correspondence. You need not be worried about your results: this is a training program, and there is not necessarily a correct and incorrect answer or response. If you like, during or after the course, as you continue practicing and you would like a review or help with a particular animal communication consultation you can send the consultation or animal communication and the human’s response, one animal at a time, with payment of $75.00 for a review from our office team of specialized professional communicators. You may wish to become a Professional Animal Communicator through the Spirits of Heart Professional Animal Communicator Certification Program. The Spirits of Heart Animal Communicator Certification Program was developed for those interested in attaining recognition as a Professional Animal Communicator. A Professional Animal Communicator helps bring humans and their animal friends closer together, to understand and respect each other, to live in harmony, and as friends and companions. The prerequisite for this program is completion of the Spirits of Heart Advanced Animal Communication Correspondence Course Modules 1 – 4. To achieve Professional Certification, you must complete 5 assigned Animal Communications and a final essay style exam. The essay exam is not about right or wrong answers, and is designed to help one in dealing with difficult areas in the business. The 5 animals to be submitted for communication evaluation will be chosen based on your previous animal communication submissions and also based on your interests and the particular skills you wish to develop. For Instance, one student was having difficulty hearing what animals had to say, so we sent her animals that we knew to be particularly vocal. Another wanted to perfect her body scans, so we sent her animals with very strong physical symptoms. As she improved her skills, we sent animals with more subtle issues so that she could become more sensitive. The 5 animal communication results are submitted to Georgina’s office one at a time for an evaluation exam fee of $500.00. You will receive instruction and feedback, including suggestions, solutions to problems, answers to questions that arise, and pointers for more thorough communications and more accurate interpretations to increase your competency and for delivering your results in the most professional manner possible. You need not be worried about your results. This is a training and mentoring program to help you with whatever questions you have or problems you encounter. Upon approved completion, you will receive a certificate confirming that you have reached the Professional Level of Animal Communicator from Spirits Of Heart Programs. As a Professional Animal Communicator, you will be helping to make the planet a more peaceful and harmonious place by working for the good of all species to help them understand each other. Successful graduates may be invited to participate in Georgina’s referral network of Animal Communicators and other practitioners who work for the well-being of our animal friends. Click HERE for the link to pay for the Professional Certification Evaluation Fee. What kind of person is an Animal Communicator? An animal communicator is a person who is very compassionate, kind, caring, sympathetic and loving to all species. You are warm and understanding and have the ability to allow yourself to be very clear and open to sending and receiving messages with animals. It is important to be able to deliver the message to the human with no personal influence or agenda. You need to be willing to work with people and animals to help to resolve issues regarding behavior, health problems and emotional issues. You love all beings from the heart, and have intentions of the highest purpose. “Dear Georgina, I have spent time going through your comments and suggestions on each of the 5 readings. I truly did find them to be very, very helpful! It appears I did a lot of things that someone just starting out would do. And that is good because it gave me a very good opportunity to learn to do my communications and deliver them in a better way. And there were a lot of areas where you found what I did good and some even excellent and I thank you for letting me know about those things. Both helped me grow! It was very helpful for you to tell me the way you would have worked with the animal and delivered the message to the client. And put another way, how I could have requested more information from the animal and given that to the client so that the client could continue to work for the good of the animal. “Dear Georgina, First off I want to thank you for your in-depth responses to my readings. I think one of my biggest worries was I would do something ‘wrong’ – and not following the ‘procedure’ correctly!! Now I am able to concentrate more on connecting with the animal, always being respectful of them, but as well ‘asking’ more questions to help them and myself with the reading – and ultimately help their ‘guardians’. “Dear Georgina, I really want to say ‘thank you!’ to you for the extra kindness & generosity you have graced me with during your wonderful correspondence course! I do feel like it has been very worthwhile to take your course. I’m really happy that I got to connect with you. Thank You So Much! It was awesome getting the feedback about Daisy, thank you! I will continue to grow & practice & I thank you for your light, gentleness, wisdom & encouragement! Clearing and Releasing Audio – For helping yourself with stress and/or pain release is included as a part of Module 4 and may be purchased separately. Recorded by Georgina Cyr. Relaxation Meditation Audio – An audio CD recording by Georgina Cyr. This Guided Meditation will help you relax and release the tensions of the day. You are introduced to the powers of the White Light for total relaxation. You are guided by Georgina’s voice while you allow peace and love into your life. The White Light will surround you and you will feel the love, peace and tranquility. The music continues for ten minutes after which you are gently brought back to the present. This audio is included as a part of module four but may be purchased separately. (20:18). Discusses Georgina’s views on working with energy and its relationship to animal communication, as well as basics on how to communicate with animals. This track comes with Module 1 and is discussed live during the workshop. You are guided and assisted with connecting to the animal. This is followed by a period of music approximately 8 minutes long, in which you will be connecting and communicating, after which Georgina will help you to bring your awareness back to your surroundings. The Animal Communication Meditation is available for separate purchase. Specially channeled for Georgina by Gabrielle Silva. Gabrielle has channeled this music from the animal angels to help you to stay relaxed while remaining focused on communicating with an animal. The Animal Angel Music is available for separate purchase. A workbook with guided meditation to help you to become telepathic. You already have the intuition you need to become telepathic and now you will be given the tools to work with. The recent changes in the earth and the inhabitants of it, especially humans, have made many of us question why we are here and where we are going. Many people have experienced things that previously have been unexplainable. It is an exciting time in that so many are embracing the possibilities of energetically interacting with each other on a different level. Working with the energies of Love and Light, we will be able to participate in a healing of ourselves and the planet. You will be guided through exercises to enable you to open the channels of telepathic communication. You will learn how to get yourself into a relaxed state to better initiate contact with another Being. You will learn how to develop the intuition you already have and how to recognize the subtle messages coming to you from others. If for whatever reason you receive the course and wish to return it within 5 days, we offer a refund of 125.00. If you have the course for 2 weeks or longer we offer a refund of $50.00.